An unassuming white envelope reveals a whimsical winter wonderland where R2-D2 is decked out in Christmas lights, his dome topped by a red Santa hat, while C-3PO and BB-8 build a snowdroid in the distance. 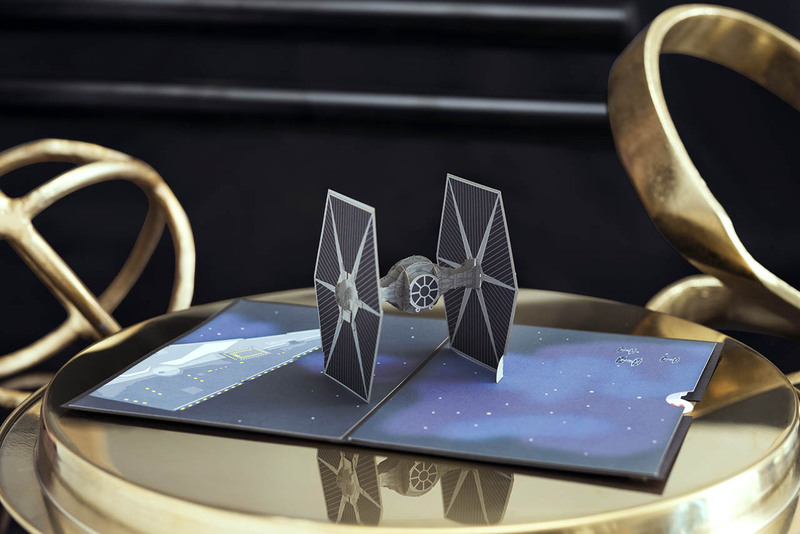 The 3D paper sculpture, designed by Boston-based naval engineers and handcrafted in Vietnam using the Asian art form of sliceform kirigami, is part of a new holiday addition to Lovepop’s line of Star Wars pop-up cards. First released earlier this year, the card maker’s Star Wars series has captured everything from climactic scenes like Luke’s X-wing trench run and Obi-Wan Kenobi’s fateful duel with Darth Vader, to finely sculpted stormtrooper helmets and the mighty Chewbacca roaring in frustration as he’s surrounded by curious porgs. 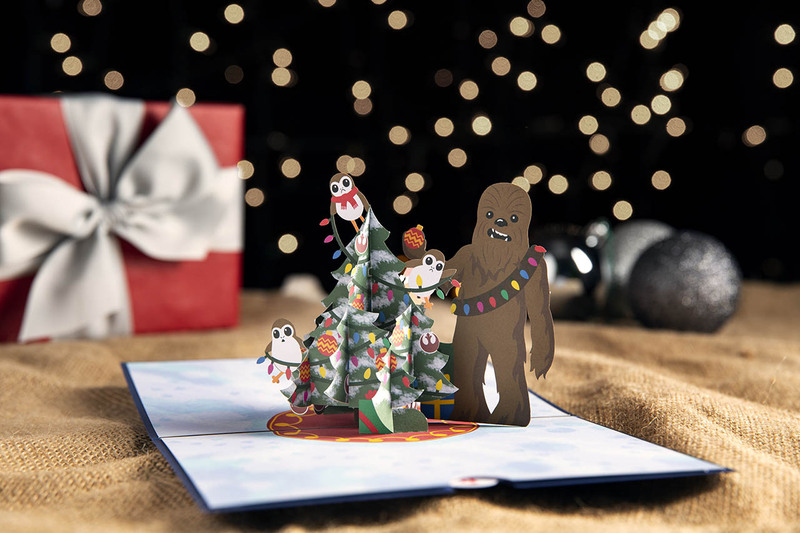 Among the new holiday-themed offerings are the festive frolicking droids, Chewbacca and the porgs teaming up to decorate a Christmas tree, and even Yoda emerging from a wrapped gift box. The latter was a riff on an earlier design, an idea that came out of a meeting involving card engineer Jozef Karpiel. “What if Yoda was slashing his way with a lightsaber out of the present?” Karpiel recalls suggesting. 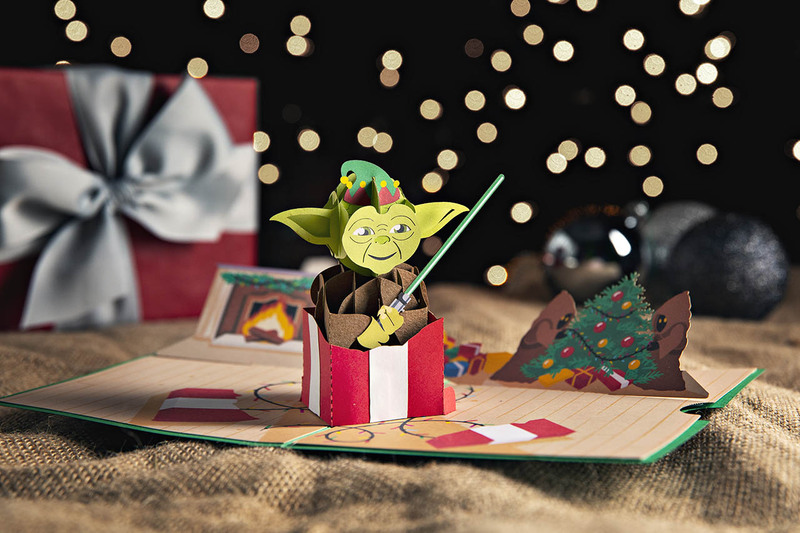 StarWars.com recently sat down with Karpiel to talk about following in the footsteps of Ralph McQuarrie, who first reimagined Yoda as a jolly old elf, and the challenges of making the perfect paper droid. When Karpiel met the two friends, they were searching for their first card designer, so he quit his day job to join them and explore how his professional background in architecture could be combined with his interests in the arts. The process to create a Lovepop card begins with a planning sheet to get down the basics of the technical design. “The more experienced you are, the more you know how the pieces will fit together and what kind of folding techniques you’ll use,” Karpiel says, allowing the design to take shape with specific folds and sizing parameters. Then an artist adds the finer points, like the stylized illustrations in the foreground and background. For the holiday line, Karpiel reimagined an earlier design he’d worked on featuring Artoo in the Tatooine desert, positioning the astromech on the card in a similar fashion. The first card gave designers a solid starting point, but other designs can also help influence their work. Once Lucasfilm approved their initial design, Karpiel got to work prototyping the card model. With about 25 different pieces to bring together in the intricate card, it took a few weeks and four or five variations before the droid’s wintertime frolic was just right. With the prototype complete, the design and manufacturing team in Vietnam helps to finesse any final kinks and questions. “They can test a lot of these things with the assembly team, so they can take the design and get a few different people to assemble it and see if there’s a way to make things better,” Karpiel says. In some cases, that means trying to streamline to process to reduce the number of parts and pieces. 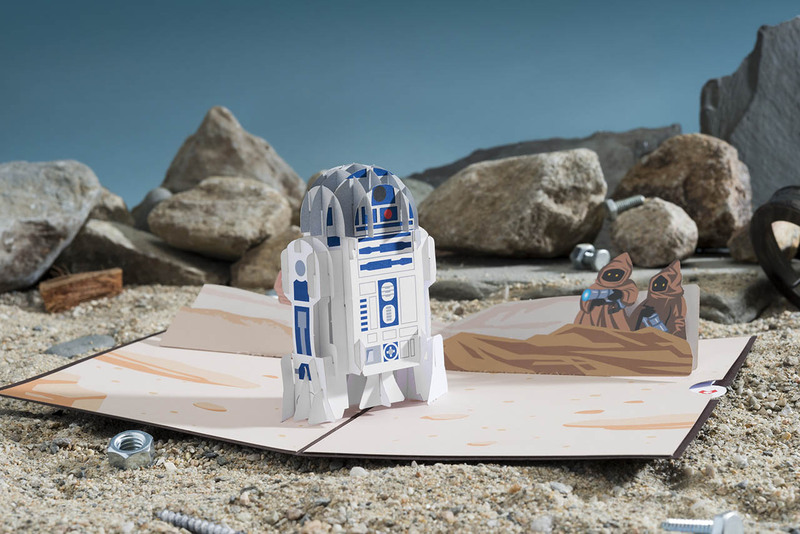 “We want the card to be as cool as possible,” Karpiel says, and Artoo is among the most complex sculptures from the line. And each card emerges as an individual piece of stunning sculpted paper art, a mini masterpiece to bring good tidings to friends and family. For a closer look at the full line of cards, visit Lovepop’s official website.